A black and white negative of Reverend Edwin Adye. Rev. Edwin Ralph Adye was born in London, England on 6 October 1897. He came to Canada in 1906 and attended school at Hamilton, ON. He served in the First World Wars and was wounded at Hill 70 in 1917. When he returned to Canada, he served on the staff of the Department of Soldiers' Civil Rehabilitation. After graduating as an Anglican priest from Wycliffe College in Toronto in 1925, he was a rector in Kinmount, ON. From 1928-30 he was assistant rector at St. Peter's Anglican Church in Cobourg and rector at All Saints' Anglican Church in Whitby from 1930-1941. 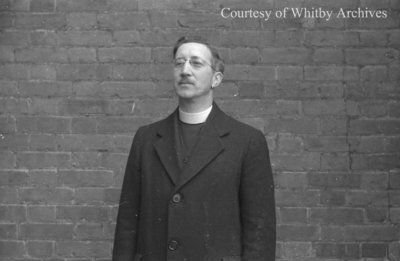 While in Whitby, Adye was chaplain of Branch 112 of the Canadian Legion and organized a drumhead service in Whitby on 24 October 1937 for Legion members throughout Ontario. He was vice-chairman of the Legion Provincial Command and Chairman of the Poppy Fund. From 1941-1945, Adye served in England as a chaplain with the Canadian Army. He was named a Canon of the Anglican Church in Canada and died at Florida on 12 April 1982. Adye is buried at Sanctuary Park Cemetery in Toronto. Rev. Edwin Adye, May 26, 1938, Marjorie Ruddy. Whitby Archives A2013_040_684B.